Property Details: 3 Bedroom, 3 Bathroom Property with approximately 1796 sq. ft.
Caribe Resort condo for sale in Orange Beach. Breath-taking island views! 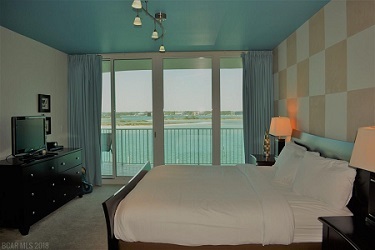 This bayfront unit overlooks Robinson/Bird Island where you can watch the sunset and the boats go by! The condo is on a great mid-level floor with tile throughout the living area. The complex has everything that you need with indoor/outdoor pools, lazy river, fitness center, and more. The master bedroom is bayfront with lots of views. The third bedroom is set up with bunk beds.